A bright-eyed freshman hoping to soak in the University’s splendor trekked north of the Yard. He headed to an auditorium at Harvard Law School, where Supreme Court Justice Antonin G. Scalia, an alumnus of the Law School, was slated to deliver a speech on interpreting the Constitution. With the sudden, serendipitous twist characteristic of most “Harvard moments,” the event turned into just that. Gaylor somehow found himself in Scalia’s limousine, en route to dinner with the jurist at the Charles Hotel. “After the speech I was talking to this gentleman, you know, just being polite,” he says, smiling at the memory. “Turns out, the gentleman was Nelson Shanks. He’s probably a nobody to you, but he’s actually Justice Scalia’s portrait artist.” Apparently impressed, the painter had extended a dinner invitation to the eager freshman. But at dinner, Gaylor wasn’t able to offer Scalia musings on life in the Yard or stories of nightly dinners in Annenberg. And that’s because, although he’s 18 years old, a liaison for an IOP study group, and a frequenter of Harvard Republican Club events, Gaylor is not a freshman at the College. The Florida native is one of few official college-aged freshmen students at the Harvard University Extension School. The school’s wide-open application process might seem paradoxical to some, especially when considered in the context of many of the University’s other schools, which have fought diligently for decades to maintain the nation’s most statistically exacting admissions standards. Last year, the College, for instance, admitted a mere 7.1 percent of applicants. Harvard Law School typically admits 11 percent of applicants, and Harvard Medical School admits just over 3 percent of candidates seeking admission. But if the story of Gaylor’s dinner illustrates anything, it is the degree to which the Extension School offers its students nearly unfettered access to some of Harvard’s most prized resources—world renowned libraries, a distinguished faculty, and an impressive body of speakers—without the hassle of the Common App, the LSAT, or the MCAT. At around 5 p.m. on a Wednesday evening, students are just starting to trickle into the Lamont Café. Spiral-bound course-packs and laptops begin to appear amid cups of cappuccino and plates of sushi. Over the continuous background drone of undergraduates complaining about homework and impending midterms, Gaylor finishes telling me about his dinner with Scalia before moving on to the other aspects of his new Harvard life. “I’m starting from the beginning. This is my college career,” he says, detailing his plan to graduate from the school in five years with a concentration in government and a citation in international relations. That Gaylor’s proposed college experience will take place entirely at the Extension School is somewhat of an anomaly, he says, as most students start at other institutions, drop out, and finish their degrees at the school. Gaylor is currently enrolled in two writing courses at the Extension School, which meet for a total of four hours per week during the evenings. Unlike College students, his flexible schedule allows him to work at a small research group, as well as attend lots of workshops and events at many of the University’s schools. My conversation with Gaylor reveals a point which has made many wary of the school’s lax admissions policy. Although the Extension School provides widespread access to Harvard’s resources, it has done so at the cost of what some see as the misrespresentation of the Harvard brand—sometimes on a national scale. When then-teeny bopper Hillary Duff described herself as taking classes at “Harvard University” in 2005, she was pilloried by the media when it became known that she was actually auditing distance-learning courses offered by the Extension School. And in 2006, West Virginia congressional candidate Chris Wakim was accused of misrepresenting his Extension School degree as one from the more-selective Harvard Kennedy School, though Wakim did note in an anrgy rebuttal that he received his degree from the Extension School while serving as an active duty infantry officer in the U.S. Army. “Most of the 14,000 students who enroll in our programs each year take just one course for personal enrichment or professional development,” adds Shinagel, an English scholar who is a former master of Quincy House. Seventy-four percent of Extension School students already have a bachelor’s degree, and 23 percent have a graduate degree. Within the Extension School’s varied array of subgroups lie innumerable differences. At Tealuxe, hip indie music whirrs underneath Claire Ward’s words. She tells me she’s been taking classes at the Extension School for seven years, starting part time in high school and continuing full time a few semesters after graduation. The Extension School prides itself on catering to “alternative students,” and Ward—although sporting a fall scarf and Longchamps bag—could indubitably be counted as one of them. But a breezy connection to Harvard social life hasn’t precluded Ward from reveling in academically-intimate moments with her peers and professors. In fact, she thinks it may well have helped her. At the Extension School, “You’re on a much more even footing, so it makes getting to know your professors in some ways much easier. That’s the magic of it,” she explains. 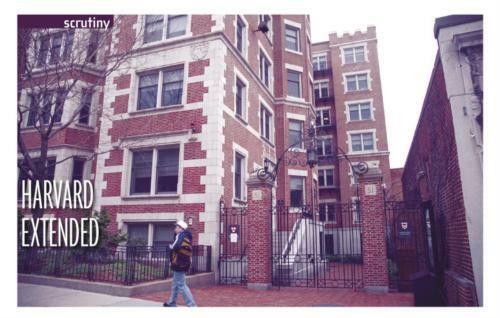 Literature professor Leo Damrosch, who teaches at both the College and the Extension School, says the Extension School’s lax admissions standards “give a lot” to the institution by permitting an atmosphere of valuable diversity that does not exist at any of Harvard’s other schools. Both Ward and Gaylor seem to agree that to have any trace of a social life, strong networking skills are a necessity at the Extension School. Gaylor, who lives in an apartment near Mather House, says he’s diligently tried to form bonds with freshmen and that he’s been largely successful. After attending several events intended for College students during “Camp Harvard,” he says he made enough friends to have dinner weekly in Annenberg and hang out in freshman dorms. “Thayer’s my favorite,” he tells me. “It’s Harvard,” Gaylor says with an indignant look when I ask him about his plans for the future. “It’s an Ivy League school. Most presidents come out of it. And, it’s a way for me to prepare in order to reach my goals.” He then informs me about his plans to run for the presidency in 2028. But Ward is less confident in both the value of the Extension School degree and the ability of the institution to steer her onto the right career path, especially when she compares her advising to the College’s more structured and extensive resources. The Latin enthusiast tells me she’s interested in applying to law school. And the words of her school’s dean, who tells me that “Harvard Extension School graduates have been admitted to all Harvard graduate schools,” might serve as the panacea to her professional school fears. Yet even if the Extension School’s career counseling might be lacking, Ward points out that she’s surrounded by a pool of incredibly qualified professionals who have been more than willing to provide her with ad hoc career advice. It’s different, but perhaps just as valuable as that offered at the College. “Because I know them from class, they’re much more willing to talk to me than if I randomly called up some law office,” Ward says. Indeed, it would seem that the the old adage holds as true for Extension School students as it does for more traditional undergraduates: you only get as much as you put in.